On the other hand the disposition of all three of the pyramids in relation to the Nile Valley eloquently signalled the much earlier date of 10,450 BC. 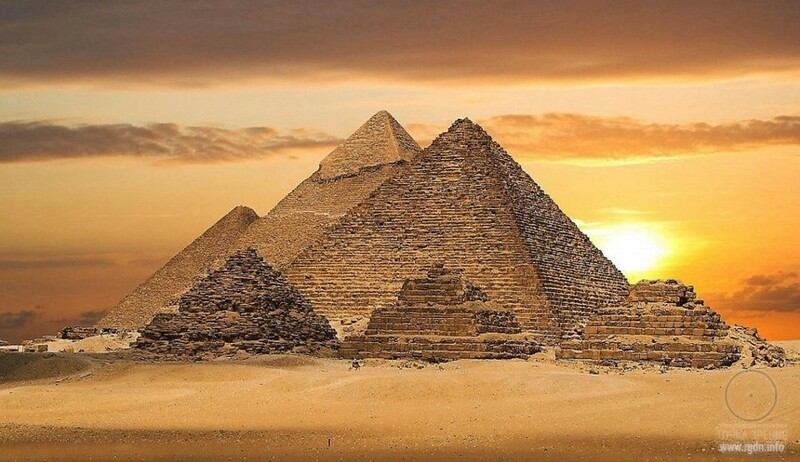 This coincided with the controversial geological findings John West and Robert Schoch had made at Giza, which suggested the presence of a high civilization in Egypt in the eleventh millennium BC. 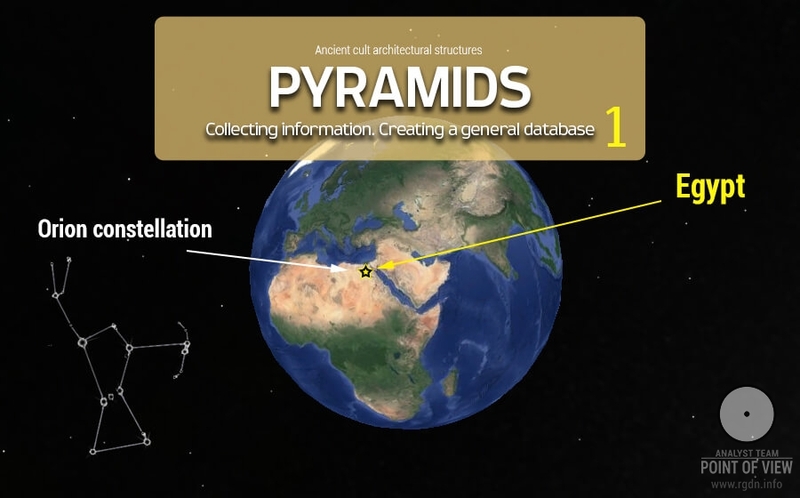 Moreover, the disposition of the pyramids had not been arrived at by any random or accidental process but seemed to have been deliberately chosen because it marked a precessionally significant event: the lowest point, the beginning, the First Time in Orion’s 13,000-year ‘up’ cycle. I knew that Bauval believed this astronomical event to have been linked symbolically to the mythical First Time of Osiris – the time of the gods, when civilization had supposedly been brought into the Nile Valley – and that his reasoning for this derived from the mythology of Ancient Egypt which directly associated Osiris with the Orion constellation (and Isis with Sirius). Had the historical archetypes for Osiris and Isis actually come here in the First Time, twelve and a half thousand years ago? My research into Ice Age mythologies had persuaded me that certain ideas and memories could linger in the human psyche for many millennia, transmitted from generation to generation by oral tradition. I could therefore see no prima facie reasons why the Osirian mythology, with its strange and anomalous characteristics, should not have originated as far back as 10,450 BC. However, it was the civilization of dynastic Egypt that had elevated Osiris to the status of the high god of resurrection. That civilization was one that had few known antecedents, and none at all recognizable in the remote epoch of the eleventh millennium BC. If the Osirian mythology had been transmitted across 8000 years, therefore, then what culture had transmitted it? 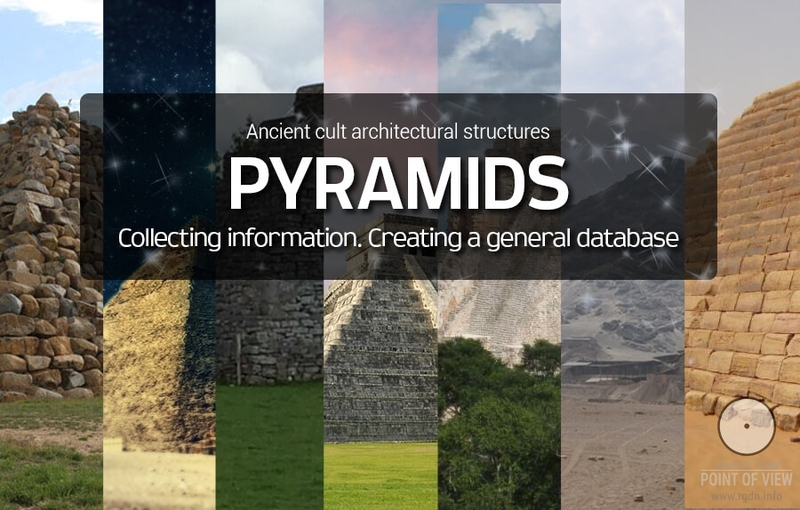 And had this culture also been responsible for both the astronomical alignments proven to have been manifested by the pyramids: 10,450 BC and 2450 BC? These were among the questions I planned to put to Robert Bauval in the shadow of the pyramids. Santha and I had arranged to meet him at dawn, at the Mortuary Temple of Khafre, so that the three of us could watch the sun come up over the Sphinx. Positioned beside the eastern face of the Second Pyramid, the largely ruined Mortuary Temple was a spooky, grey, cold place to be at this hour. And as John West had indicated during our conversation at Luxor, there could be little doubt that it belonged to the same severe, imposing and unadorned style of architecture as the better-known Valley Temple. Here, at any rate, were the same enormous blocks, weighing 200 tons or more each. And here too was the same intangible atmosphere of vast antiquity and awakening intelligence, as though some epiphany might be at hand. Even in its present, much despoiled state, this anonymous structure, which Egyptologists had called a Mortuary Temple, was still a place of power that seemed to draw its energy from an epoch far in the past. I looked up at the huge mass of the Second Pyramid’s eastern face just behind us in the pearl-grey dawn light. Again, as John West had pointed out, there was much to suggest that it might have been built in two different stages. The lower courses, up to a height of perhaps thirty feet, consisted largely of cyclopean limestone megaliths like those in the temples. 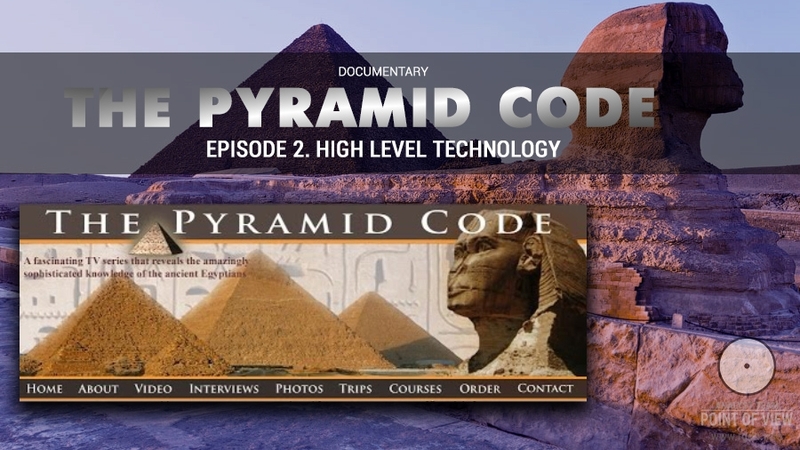 Above this height, however, the remainder of the pyramid’s gigantic core had been formed out of much smaller blocks weighing around two to three tons each (like the majority of the blocks in the Great Pyramid). Had there been a time when a twelve-acre, thirty-foot-high megalithic platform had stood here on the ‘hill of Giza’, west of the Sphinx, surrounded only by nameless square and rectangular structures such as the Valley and Mortuary Temples? In other words, was it possible that the Second Pyramid’s lower courses might have been built first, before the other pyramids – perhaps long before, in a much earlier age? How high was the knowledge of those prehistoric inventors? I suppose that I must have looked puzzled. 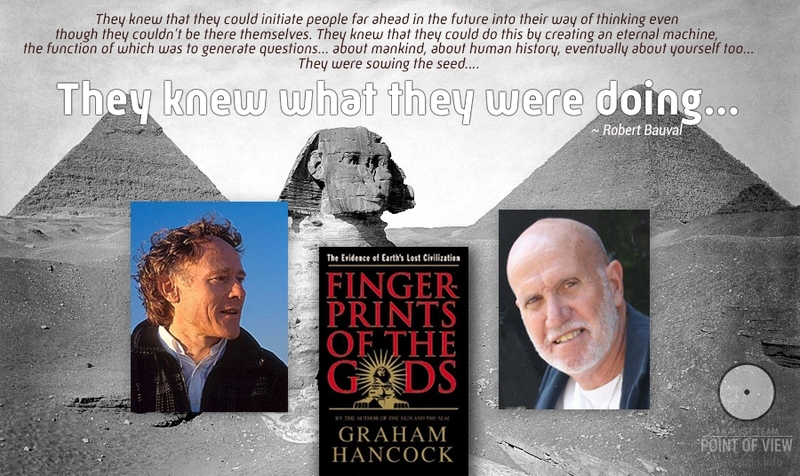 As Robert, Santha and I sat out on the Giza plateau that cold December morning at the end of 1993, we watched the winter sun, now very close to solstice, rising over the right shoulder of the Sphinx, almost as far south of east as it would travel on its yearly journey before turning north again. 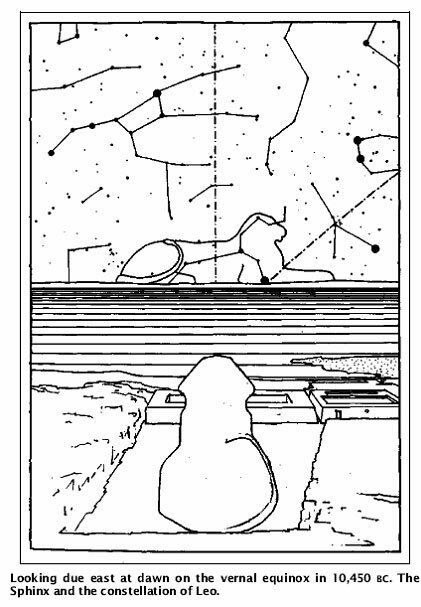 The Sphinx was an equinoctial marker, with its gaze directed precisely at the point of sunrise on the vernal equinox. Was it, too, part of the Giza ‘grand plan’? Why should the equinoctial marker have been made in the shape of a giant lion? In our own lifetimes, the epoch of AD 2000, a more suitable shape for such a marker – should anyone wish to build one – would be a representation of a fish. This is because the sun on the vernal equinox rises against the stellar background of Pisces, as it has done for approximately the last 2000 years. The astronomical Age of Pisces began around the time of Christ. Readers must judge for themselves whether it is a coincidence that the principal symbol used for Christ by the very early Christians was not the cross but the fish. During the preceding age, which broadly-speaking encompassed the first and second millennia BC, it was the constellation of Aries – the Ram – which had the honour of carrying the sun on the vernal equinox. Again, readers must judge whether it is a coincidence that the religious iconography of that epoch was predominantly ram-oriented. Is it a coincidence, for example, that Yahweh, God of Old Testament Israel, provided a ram as a substitute for Abraham’s offered sacrifice of his son Isaac? (Abraham and Isaac are assumed by biblical scholars and archaeologists to have lived during the early second millennium BC). Is it likewise coincidental that rams, in one context or another, are referred to in almost every book of the Old Testament (entirely composed during the Age of Aries) but in not a single book of the New Testament? And is it an accident that the advent of the Age of Aries, shortly before the beginning of the second millennium BC, was accompanied in Ancient Egypt by an upsurge in the worship of the god Amon whose symbol was a ram with curled horns? Work on the principal sanctuary of Amon – the Temple of Karnak at Luxor in upper Egypt – was begun at around 2000 BC 23 and, as those who have visited that temple will recall, its principal icons are rams, long rows of which guard its entrances. The immediate predecessor to the Age of Aries was the Age of Taurus – the Bull – which spanned the period between 4380 and 2200 BC. It was during this precessional epoch, when the sun on the vernal equinox rose in the constellation of Taurus, that the Bull-cult of Minoan Crete flourished. And during this epoch, too, the civilization of dynastic Egypt burst upon the historical scene, fully formed, apparently without antecedents. Readers must judge whether it is a coincidence that Egyptians at the very beginning of the dynastic period were already venerating the Apis and Mnevis Bulls – the former being considered a theophany of the god Osiris and the latter, the sacred animal of Heliopolis, a theophany of the god Ra. Why should an equinoctial marker have been made in the form of a lion? 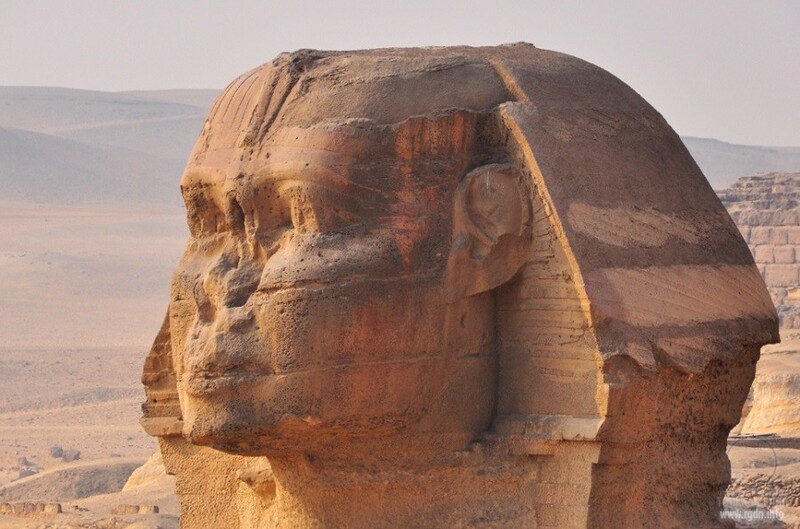 I looked down the slope of the Giza plateau towards the great leonine body of the Sphinx. 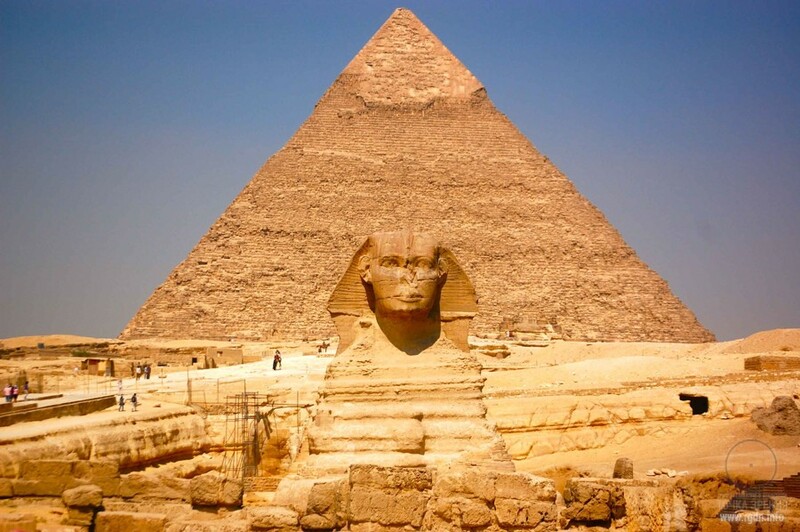 Khafre, the Fourth Dynasty pharaoh believed by Egyptologists to have carved the monument out of bedrock around 2500 BC, had been a monarch of the Age of Taurus. For almost 1800 years before his reign, and more than 300 years after it, the sun on the vernal equinox rose unfailingly in the constellation of the Bull. It follows that if a monarch at such a time had set out to create an equinoctial marker at Giza, he would have had every reason to have it carved in the form of a bull, and none whatsoever to have it carved in the form of a lion. Indeed, and it was obvious, there was only one epoch when the celestial symbolism of a leonine equinoctial marker would have been appropriate. That epoch was, of course, the Age of Leo, from 10,970 to 8810 BC. Why, therefore, should an equinoctial marker have been made in the shape of a lion? Because it was made during the Age of Leo when the sun on the vernal equinox rose against the stellar background of the constellation of the Lion, thus marking the coordinates of a precessional epoch that would not experience its ‘Great Return’ for another 26,000 years. Around 10,450 BC the three stars of Orion’s Belt reached the lowest point in their precessional cycle: west of the Milky Way, 11° 08’ above the southern horizon at meridian transit. 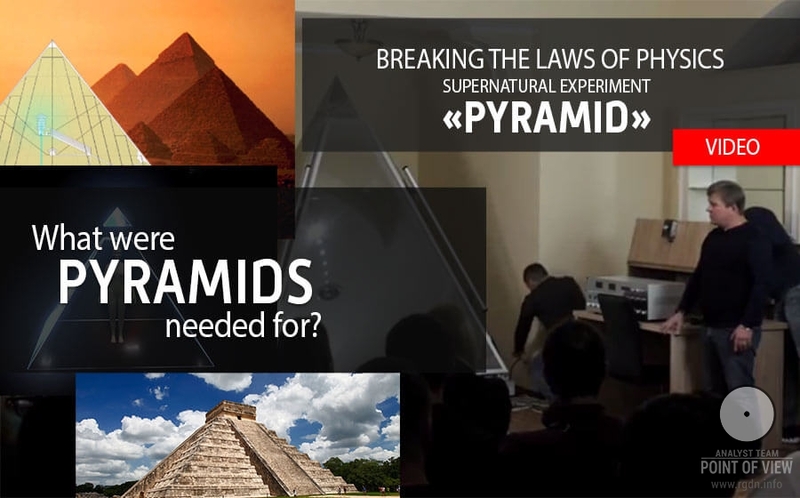 On the ground west of the Nile, this event was frozen into architecture in the shape of the three pyramids of Giza. Their layout formed the signature of an unmistakable epoch of precessional time. Around 10,450 BC, the sun on the vernal equinox rose in the constellation of Leo. 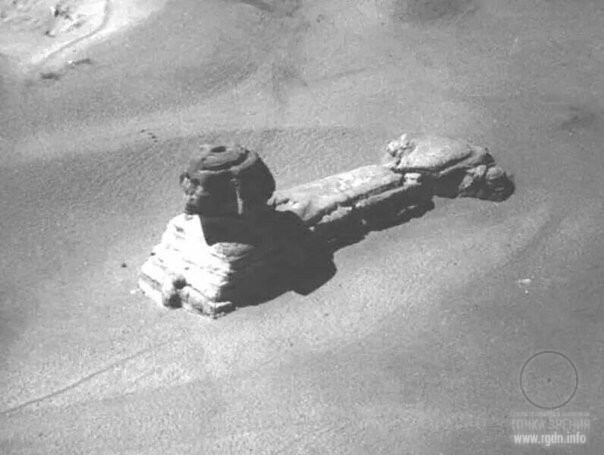 On the ground at Giza, this event was frozen into architecture in the shape of the Sphinx, a gigantic, leonine, equinoctial marker which, like the second signature on an official document, could be taken as a confirmation of authenticity. ‘Obviously because it was an important time for them,’ suggested Santha. 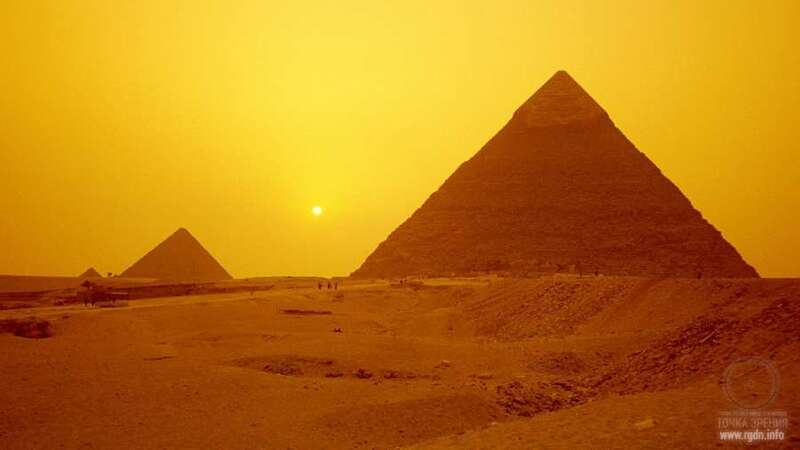 We fell silent, for a long while as the sun climbed the sky south-east of the Great Sphinx.